(01-11-2018, 11:18 PM)Durandal Wrote: [ -> ] myself who undertake the miserable task of doing the dirty work that nobody else wants to touch. I can confirm Durandals great work, I sent the model for the Corsair destroyer in 2016, it looked like this . 2018 is well under way and we can see his magic touch here . It looks great folks! We have a lot of great modelers in this community (Dave, Swallow, Unlucky to name a few). They all do great and fantastic stuff, they want to spend their free time to do stuff for this community, really nice people! Then, they hit the wall (the wall being you). You block them and deny them the chance to contribue to the community. Which is understandable, you aren't really doing anything so this is a normal defensive reaction. Personally, I see you as the problem here, not them. You have low energy, the amount of work you do is minimal at best, hand over the position to someone who is willing and knows how to run things. ... and everyone will be happy. We DO NOT accept half-done, unfinished, untextured and untested models in the Model department, period. Nor are we obliged to finish anyone else's work. Also. If you continue flaming just enough times, the Model department CAN end up becoming emptier than the vacuum of a LED bulb. And I sure as hell won't be stepping in to lead it, I promise you that. Do people even read their own comments? Is it just me who sees the major ungratefulness all around, directed toward the model department (which happens to be the LEAST populated one for that same reason + the added complexity of work)? FYI: Justin is the one who fixed and exported the Deimos, plus he finished and prepared OTHER ships for next patch. Mere months ago he brought you 2 unique, animated, high-quality toys he himself created, in the face of the Benzaiten (GMG VHF) and Interloper (LH Gunship). Last but not least, that thing here: https://p3d.in/QWvvo Yeah, honestly, forget it. It is an insult to the quality we strive for. We didn't make it and we certainly don't feel responsible for its poor quality. If people can't be arsed to finish and quality-check their stuff, then don't blame us. Nobody did flame you guys. I still don't understand why going mental. We just say, Dave does nice job. I would if I could, but I don't have that skill, however, many great people in this community have, shame it's not being used. As you can see here, he said he would finish it off, I didn't throw it at him and said "go do it", and here we are, 2 years later. With that being said, I don't think your tone here was appropriate. (01-12-2018, 04:40 PM)eigos Wrote: [ -> ] Last but not least, that thing here: https://p3d.in/QWvvo Yeah, honestly, forget it. It is an insult to the quality we strive for. We didn't make it and we certainly don't feel responsible for its poor quality. If people can't be arsed to finish and quality-check their stuff, then don't blame us. So, what's with that? You say one thing 2 years ago and now suddenly you change your mind? Trolling the Corsair playerbase and myself for 2 years is also alright in your book? How many hours of effort has been wasted from the players to see this ship ingame and you just go "lol nope bai" ? 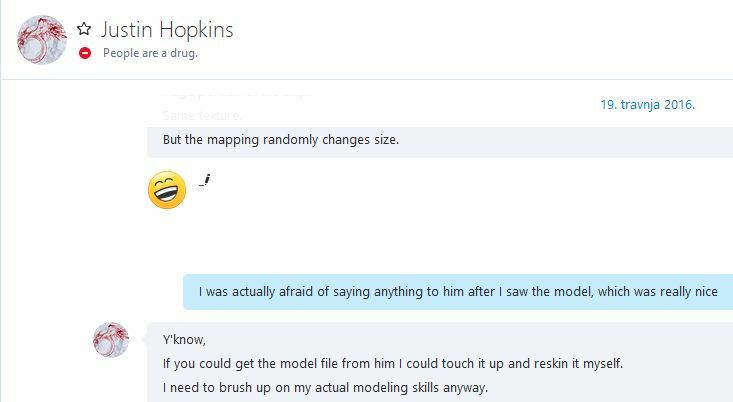 A while ago I remember the Model Dev Team communicating that some models are held back a bit because there was a quality guide document or thread in the making and it was a priority at the time, intended to be published before moving onto anything else. It was promised to be informative on what the team considers acceptable in terms of quality in order to help modellers who are not part of the team. What is the status on that? That doesn't really qualify as showing off work. It does qualify as snide remark with smiley face to express muh internet superiority. I was only replying to that particular comment, and I certainly did not need or to step in on my behalf. To clarify on what Eigos said, accepting half finished work is entirely situational. I'm not going to turn something away 100% of the time because it isn't done. I cannot, however, accept models that are flat out broken from the get-go because it is simply too much work to fix. If anyone ever watched me livestream the smoothgrouping and hardpointing of the Deimos, you'll understand what I mean. I wasn't even the one who ended up hitboxing it. Yes we really need those quality guidelines. That's a lot of stuff I have to write and a lot of writing I don't want to do, on top of working through the current backlog. What ended up happening is I had to get a job, was working 40 hours a week at a ***** seafood market with no time nor energy to do what I loved, and am now trying to do the whole freelance artist thing for a living. The bottom line is that art/content pays the bills, and abstract things like guides simply don't. If someone were to throw me a fifty bucks to do it I'd write the thing up in a heartbeat, but I honestly can't see that happening. The model is, was, and always will be a lot of very descriptive things that I am obligated not to say on this forum. I said the shape, the silhouette of the ship, was nice and easy to balance. That says NOTHING about the quality of the mesh, texturing, smoothgrouping, detailing, et cetera. Please stop putting words in my mouth and stop harassing me about a model that will never make it into the game. This is the last time I am going to ask you kindly. And no, we do not have "A lot of talent" in this community that is being wasted. We have three (four, with back, but who knows how long that will last) people who know what they're doing and two people who repeatedly deliver CMPs that are poorly textured, not smoothgrouped, incorrectly hardpointed and hitboxed, etc. I've tried to demonstrate what these things are, why they are necessary, and how to do them via streaming, and by god I'm going to keep doing it, even if the end result is one person a year actually picking up the tools and doing the ***** correctly. On the other hand it still sounds like external help is blocked by the lack of this written quality guide and by extension by your personal life leaving you with a lack of free time to complete the guide. These streams sound like a way to both do stuff (as in working through the current backlog) and show people how to do stuff, couldn't these be turned into actual YT video guides on how to do the things in order to achieve the desired quality as you would write down in the quality guide either way? I mean like doing two things the same time: teaching through actual work. Maybe you could save time with that. Its something to think about, but its really not the same as being able to reference "as per article III subsection b smoothgroups should not be used on angles greater than 45 degrees" or whatever. Videos are good for teaching people who watch through them from the beginning, but are difficult to learn from afterwards and very time consuming as a reference to correct mistakes. Addendum: I really need to stop quoting people directly above me. Eigos, Want to Talk about Insults? How about this? As you can see here, Durandal specifically states that he does not accept Milkshape exported models and yet the model in question is clearly an export from Milkshape. And the person then proceeds to bash my work claiming it is mine, these are the reasons why he will not accept my work. Now ain't that an insult. You call yourself shorthanded, and yet when i repeatedly asked what needs to be done, you give me Cold Air. Downright Ignore mode. This is the reason why I left Modeling for Discovery. You say you don't have "Talented" people yet you chase away people who want to contribute, willing to learn. Nobody starts perfect. With time and practice people improve, yet you deny people these kind of opportunities. Maybe you don't need an article to reference, if you set up the streams like lectures about a specific topic you are discussing in relation to your work during the stream you can just refer to each like "like I said in the previous video" or "the video about smoothgroups". If the videos then saved and uploaded somewhere freely accessible (YouTube?) they can be viewed any time by anyone interested in Model Devving, and learning through rewatching the videos would be the same as watching the stream directly. And then a guide thread can just be made containing the links to the guide videos.